Indiana Debt-Relief Options: Is Debt Consolidation Right for You? Indiana was ranked first in the Midwest and sixth in the country for best places to do business, according to CEO magazine. And some of the economic statistics would certainly lend credence to these placements. The Hoosier State has a diverse economy with a gross product of $341.9 billion in 2017. According to the Bureau of Labor Statistics, manufacturing makes up the bulk of Indiana’s income providing jobs to a whopping 17 percent (the highest in the country) of the state’s workforce. The state’s five leading exports are motor vehicles and auto parts, industrial machinery, electric machinery, optical and medical equipment, and pharmaceutical products. In fact, the Hoosier State ranks fifth among all US states in total sales and shipments of pharmaceutical products and second highest in the number of biopharmaceutical-related jobs. The success of these diverse industries also means that Indiana is fortunate to have a lower-than-average unemployment rate of 3.4 percent. The above stats would appear to be signs of a flourishing economy; however, they don’t tell the whole story. In a recent survey Indiana didn’t fare so well: while scoring eighth in the nation for fiscal stability—which makes sense given the healthy economy—Indiana ranked at the other end of the chart at 48th for quality of life. But even with a healthy economy and low unemployment rates, thousands of Indiana residents still find themselves with massive debt to their name. If you’re one of them, there are several debt-relief solutions available to help you get your personal finances into shape. It may not yet be clear which tactic to use to get you started on the road to financial freedom, but what is clear is that it’s time to take control of your debt. You may want to consider debt consolidation or one of the other methods—it just depends on the details of your situation. 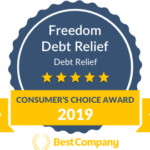 Indiana residents can visit Freedom Debt Relief or call 800-910-0065 for a free debt evaluation to discover the best way forward. When you decide it’s time to get your debt under control, there are several options to choose from. You may have heard of some debt relief solutions like debt settlement or debt consolidation and wondered what the terms mean. A debt consolidation loan, as the name suggests, allows you to consolidate or combine your debts into one loan. This is a popular choice for many Indiana residents as it makes it much easier to keep track of one monthly payment instead of multiple payments with varying due dates. A debt consolidation loan should have two things going for it: A lower interest rate than the rates on your cards, and a predictable, regular payment to the lender each month. Another benefit of a debt consolidation program is that you’ll have a specific end date. This will help you to budget more effectively, and hopefully motivate and enable you to keep going with the payment plan. One of the worse aspects of being in debt can be the feeling that you’re on your own with no way out. But people all over Indiana—in fact all over the country—are struggling with debt. Even those making decent money aren’t immune because it appears that households with higher incomes also have higher credit card debt. US households in the top earning brackets have an average of $11,200 in credit card debt, which is nearly four times as much as households in the lower brackets. However, those on the lower end do carry more debt if you compare it to their income. Take a look at some of the statewide debt statistics. The average household is $7,030 in debt. The average consumer has 1.91 credit cards. Residents owe 13.63 percent of their income to credit card companies. Approximately 2.5 million US consumers (some of whom live in Indiana) seek debt relief services each year for heavy debt burdens. Why wait any longer? Start researching the most suitable debt-clearing solution for you now. Find out if debt consolidation or one of the other programs is the best way forward for you. Visit Freedom Debt Relief or call 800-910-0065 and speak with a Certified Debt Consultant. Start your journey toward financial freedom today.